Adding a kitchen scale to your arsenal makes a world of difference in everything from baking to cooking to mailing out small packages. No more guessing games. No more converting weight measurements to metric measurements. Everything gets easier once you have a kitchen scale – if that kitchen scale is accurate! The Etekcity Digital Kitchen Scale is one of the top-selling scales around, but top-selling doesn’t always equate to most valuable. Let’s take a closer look to see what this scale is all about! The Etekcity Digital Kitchen Scale was created by Etekcity to be an affordable, highly precise kitchen scale that could fit into the sleek design of any kitchen – modern or otherwise. With simple buttons, users can measure out specific amounts without any extra hassle. This specific digital kitchen scale might be the right choice for you if you are looking to measure your food by weight to cook or bake with. It might also be good for people who want to work on their portion control with meal planning. It’s easy to portion perfect meals with this scale. While the scale is accurate within about 1%, it doesn’t start measuring until three grams or more, and it only shows whole numbers. For some people looking for the utmost of accuracy, a kitchen scale like this one might not be enough. Very precise bakers might find it frustrating for the same reason. 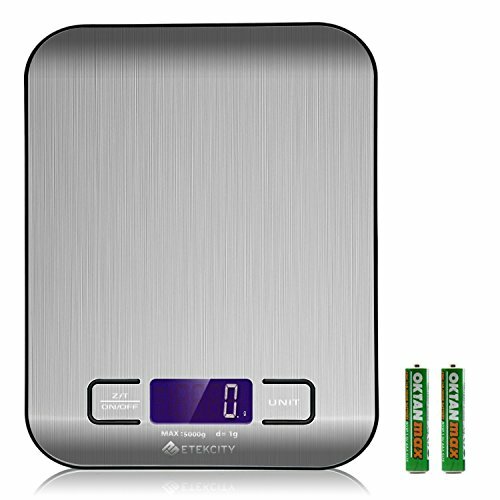 This digital kitchen scale from Etekcity only comes with a few things: the kitchen scale, the required AAA batteries, and a thorough user manual. These items are all essential and expected. One additional item that is included (though not in the box) is a one-year limited warranty. 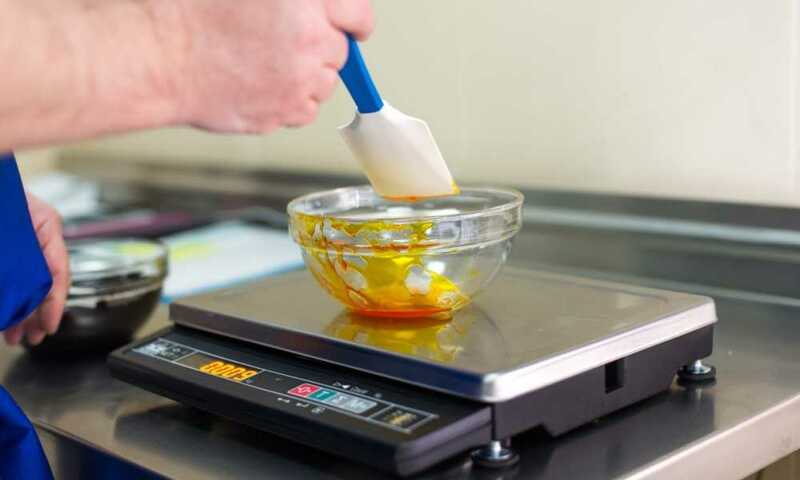 This warranty will ensure you have a great experience with the scale for at least the first year, ensuring that no manufacturing errors make the item impossible to use. There’s quite a lot to love about this little scale, but its functionality in your home will largely depend on the specific features. The scale has a nice stainless steel finish. Not only does this look great, but it also makes it very easy to wipe clean without having to scrub if it gets messy as well all know it probably will. It will also match any stainless steel appliances. The weighing options on this scale are simple to use and well-developed. First, there is an easy tare function. If you want to weight something in a bowl or measure a liquid, you can zero the scale with the container on it. Then, add the item being weighed for an accurate reading. Additionally, you can easily change between ounces, grams, pounds, and milliliters while using this scale. This makes it easy to make recipes without having to do the tedious conversions before beginning. While the LED screen is a very good size and has a great low battery indicator, it has a few ticks that may be frustrating. The screen stays brightly lit for 10 seconds, and then the backlight turns off. This can make it very hard to read the measurement if you are not standing at the right angle. The scale is accurate – to a degree. You cannot measure most things that are under 3 grams with any real accuracy, and there is a one percent margin of error. Depending on your specific needs, this could be a deal breaker… or it could be water under the bridge. If you have never used a digital kitchen scale before, you might be a bit intimidated when you first unbox your scale. But don’t worry because it’s quite simple to use a well-designed scale. All you need to do is put the food directly on the scale after turning it on. Alternatively, you can press the “tare” button while you have a container on the platform. Then, add the ingredient to measure it. For those that want more precise measurements or a backlit screen that will stay on for a longer period of time, the Smart Weigh Cuisine Scale might be the right choice. In addition to being capable of weighing down to 0.1 grams, it can also be used with the bowl it comes with, which makes it very easy to fit nearly any item onto the measuring area. This scale only measures in grams and ounces, but most people do not need a scale to measure liquids. If you do, however, you will want to stick to the Etekcity scale instead of this alternative. Many people see kitchen scales of any type as an unneeded luxury, particularly for those who don’t do a lot of precision baking. In reality, the best kitchen scale will be one that can elevate your cooking to the next level without you needing to do anything at all! The Etekcity is one such kitchen scale. It’s very simple to use, which makes it an intriguing starter scale for beginners. On top of that, it’s easy to clean and fairly precise, so even more experienced chefs and bakers will find it to be a useful addition to their appliances. No matter what you plan to make next, make it more accurately with the help of a precise digital scale like this one.